December 1 is entirely up to you. We can do anything you want. If you wish, please begin a discussion in the comments below or on twitter. On November 24, you will give presentations about the “dark side” of social media and all of the things we have discussed in class so far. The presentations will all be online, we will not be in class. I will send a link to an online conference by email. Make sure you have a strong Internet connection and a headset with microphone for the Web conference. Please use online communication tools to organize the presentations. Please do not rush to a decision like last time. Begin by brainstorming topics, then ranking them, then selecting what you want to do. Feel free to use any tools: Twitter, Google Docs, etc. Keep the presentations informative but also entertaining. Do mention your sources and do educate us about something we don’t already know. But, you do not need to work on this presentation as much as you would on the final paper. Please ask questions about the presentations in the comments below, or use them as you wish to organize and coordinate. is informative and maybe even entertaining; it addresses the topic in some depth. is well-informed by a variety of sources, not all scholarly sources. It is up to the group to decide how many presentation to give, and whether to make them team or individual. It is up to the group to divide the available time among presentations. The presentations need not all be the same length, but they do need to fit in the 6-9 time slot. Allow time for two 10 minute breaks, some buffer for technical difficulties (15 min), and time for questions and discussion. Each student will browse a number of journals and conference proceedings from 2014 and identify 2 articles they want to read. The 2 articles must be outside the student’s main area of interest. Then, each student will blog reading notes about the 2 articles before class time. The reading notes will be detailed enough to help others understand the article, but will still be concise. Make this an exercise in the art of effective explanation of scholarly research. Then, during class time, all students will read and comment upon each other’s blog posts. Please find below a list of publication outlets where you are likely to find research on social media. Browse their tables of contents for the current year and pick 2 articles. Of course, you will need to get the full text through the libraries’ site. This list is not exclusive, it’s just what I could think of off the top of my head, but I am missing many other ACM conferences that publish social media research. As you come across more, please list them in the comments below. If you need some help with Twitter, please see these resources – and also ask me on Twitter! 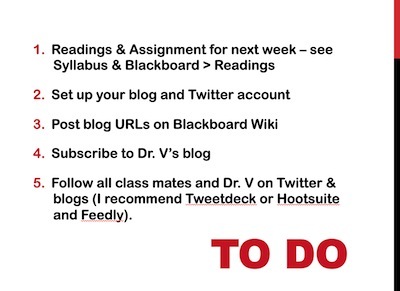 It would be really helpful if you can get to this to do list in the next 2 days – so we can manage to follow each other by the time next class comes around. Also, I need to know if you are following this blog. Please leave a comment (“great post” will do ;)) to let me know you saw it as soon as you do see it. Remember that this Thursday you’re presenting on a topic related to the dark side of the social internet. Let’s tentatively plan to present remotely (but don’t get out of town yet). Please use comments to this post to propose & discuss ideas for the Wild Card class on Dec. 1. It is your class, I am open to all ideas. Thank you all for the good work you did trying to get your drafts as complete as possible. Now you get to take a brief TECH 621 breather while I provide feedback on your drafts. Final project presentation, next week, April 26 – please upload your slides on BB, I’d like to share them with Radian 6 partners. Final project deadline, exam week, May 3 – that’s when your final-final paper will be due. Look out for another blog post with details. Blog & social media immersion assessment – make your blog ready. Make sure you have clear tags and categories for your comments and article analyses. I will be grading social media immersion after class next week (after April 26). Please let me know you saw this post by leaving a brief comment, liking, or assigning a star rating. Some students have pointed out that they only have access to the past 30 days of data from R6, not 30 days since the beginning of the semester. For most of you, this may be more than enough. Make sure you set up your widgets by specifying a date range, and not by using real-time monitoring. In my account, when I specify a date range, I can go back in time much further than when I use real-time monitoring. So, check that first. You should be able to go as far back as January of 2011. But, if January and February are greyed out, then you know for sure your account is limited to 30 days. In this case, you may contact @vargasl. She will need your Purdue email to find your account, and she will be able to set access to 30 days since the day the account was set up back in February.